Until recently I had forgotten how much fun cookie decorating can be. A group of friends and I were getting together and the friend who was hosting insisted on preparing some cookie decorations so that we could all decorate cookies. The rest of us were indifferent to the cookie decorating idea, but the other friend was SUPER into the idea so we went along with it. So when we all arrived to her house she had various frosting colors, sprinkles, and cookies prepared for us to decorate and despite not feeling super into the holiday spirit we began to cover the cookies in frosting. One by one we picked between the festive red, green, or white frosting and sprinkles and one by one I began to feel more festive. I began to feel more Christmas-y. We all started to laugh a little louder and somehow care a little deeper. Between the perfectly lit Christmas tree and the feeling of togetherness that a simple activity brought, I began to feel the magic that comes from Christmas. Cookies and Christmas go hand-in-hand. There's something about the magic of giving and the magic of baking that work together so seamlessly. One of my favorite Christmas cookies of all time is a gingerbread cookie. Not a crunchy, gingerbread type cookies, but the soft, chewy, melt-in-your-mouth kind. I love the spiciness that comes from a gingerbread cookie and that they can be made less sweet than most cookies. 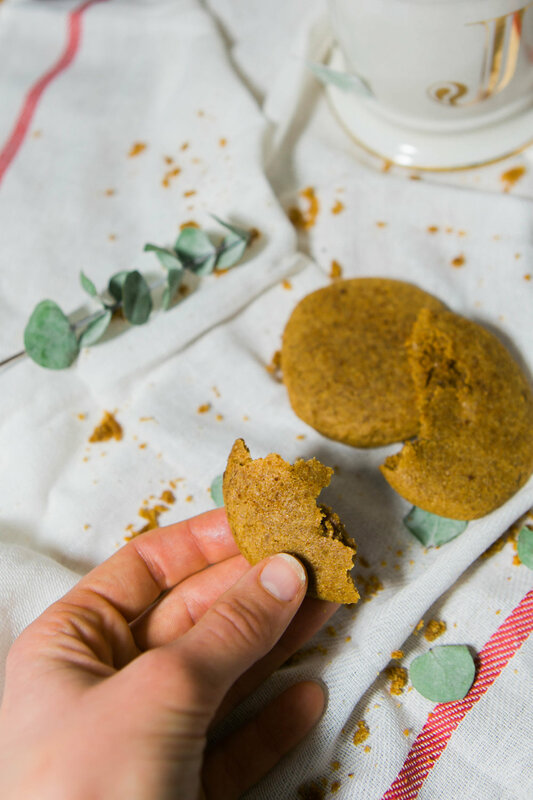 When one of my blogger friends, Madeline, asked me to participate in her #CookieSwapParty this year, I was thrilled and knew I had to find a soft gingerbread cookie recipe that didn't use an dairy. It ultimately ended up turning into a vegan cookie that can accommodate even more dietary preferences, which is super awesome! I used coconut butter to keep the cookies soft and moist and maple syrup to keep with a natural sweetener. 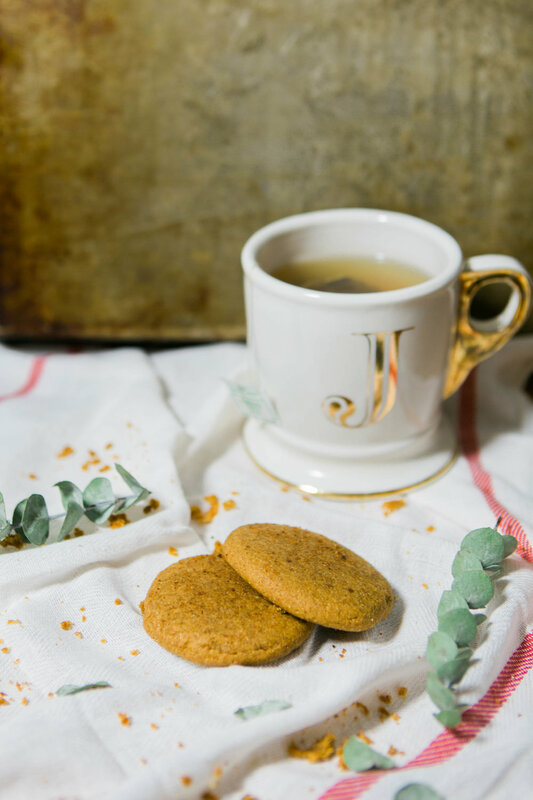 I love Madeline's idea to spread some virtual cookies and virtual love around the web during this Holiday season and I am thrilled to be apart of it. Check out the recipe and the rest of the cookies that the other lovely ladies have to offer below. 1. Preheat an oven to 350 degrees and line 2 sheet pans with parchment paper. 2. Add the flour, baking soda, cinnamon, allspice, ginger and salt to a large bowl. Whisk together. 3. Add the syrup, molasses and the liquid coconut butter last. 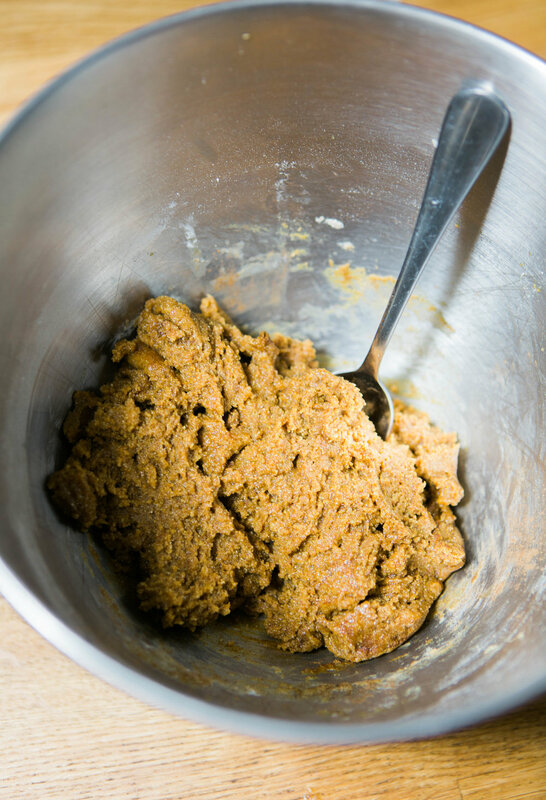 Give the liquids a quick stir and then mix all the batter together for about 30 seconds until it all comes together into a sticky, thick batter. 4. Use an inch and a half cookie scooper to measure out the dough and then form the batter into balls with your hands and place on the pan about 3 inches apart from each other. Using the bottom of a glass or measuring cup, flatted the balls into rounds that are about 1/4" thick. 5. Bake for 8 minutes. Remove and cool 10 minutes on the pan. Note: It's super important that the coconut butter is measured as a melted, liquid consistency. I put it in the microwave and heat it for 20-30 second increments, stirring between cook times, until it is completely melted. Be careful not to overcook it as it will burn. Optional: Sprinkle with coconut sugar before baking.